I wanted to let you know that SPACENK UK have currently a number of great free gifts with specific purchases available while stocks last – see link here for further details. One of these offers is a free gift of a EVE LOM Travel Care Collection when you purchase selected suncare. This travel-friendly set comprises the cult favourite Cleanser – 30ml, quarter Muslin Cloth, Rescue Mask – 15ml and TLC Cream -three 5ml sachets –(will also do a review on these products soon. Therefore as I needed more Ultrasun SPF 50 Extreme Sun Protection – £20 for 100ml, I ordered it and entered the code ELSUNCARE at checkout and received the free EVE LOM set, was also able to choose three free samples at checkout and got free shipping too. The Ultrasun range was developed in Switzerland and is described as delivering very high levels of protection against both UVA and UVB rays with just one application a day. All of the Ultrasun products are water-resistant and will carry on protecting you even after repeated swimming, watersports and towel drying with absolutely no need to re-apply during the day – Once a Day. I totally agree with their claims as my skin is very sensitive in the sun and I therefore need to use very high factor sun protection as well as making sure I do not stay out in the sun at peak times or for prolonged periods. 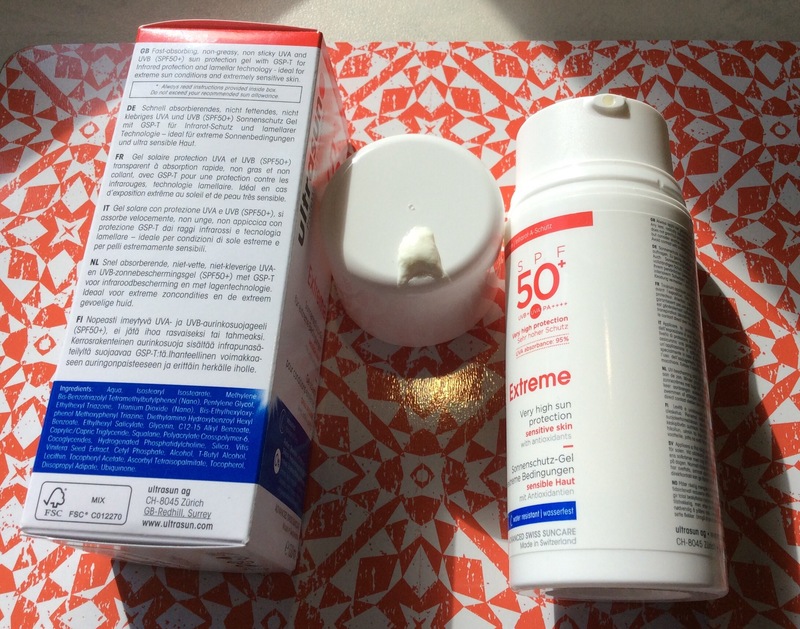 I put on the gel / more a cream lotion at least half an hour before I am going out and I find that it does last all day but sometimes if I am in the water a lot / sun stronger than normal I do reapply on specific areas of skin for my own assurance – may not need to but just prefer to do this. The Ultrasun product I purchased has a pump applicator, no strong fragrance and does not take long to sink into the skin, although states as non sticky I find the higher factors are slightly sticky until they sink in but that does not take long. I would highly recommend the Ultrasun range for everyone especially those with sensitive skin – Please see my earlier review on the Ultrasun Lipbalm here which I absolutely love too and cannot be without all year round. I would definitely recommend looking at the SPACENK UK free gift offers especially this offer and the Ultrasun sun protection range – and also if you are a new SPACENK UK customer when you use my referral link HERE you will get £10 off your first online order when you spend £40 or over, choice of three free samples and free shipping. I hope you found this useful – I also intend to do further short posts on other offers I have been lucky enough to get and are still available. Enjoy the remainder of the weekend and take care.